Then a few days later I started getting a more “official” notice. I took a quick look online and it seemed that MediaFire had already swept their website for any mention of the desktop tool. No blogs about it, no notices, nothing. Thank you for contacting Mediafire. 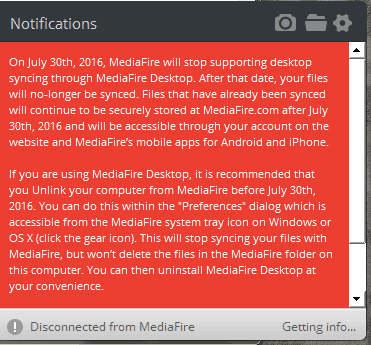 Currently we are in the process of deprecating Mediafire Desktop and will no longer be supporting Desktop and the software will no longer work after July 30. At this time we do not have an alternative for syncing your files. We are in the process of updating our website to improve many of its core features. We appreciate you choosing MediaFire. So it would appear they have no plans for desktop sync. This makes no sense to me whatsoever. Their sync tool functioned perfectly well enough, it had the screenshot tool and everything. I could share files, get my direct download links from the Explorer context menu, etc. Then this! Well this simply won’t due. With no information about an upcoming better tool, or even 3rd party tools, I immediately removed their sync software from all my devices and signed up for Office365 for Business. Bye bye Mediafire, you will not make me try to manage all my files through a browser interface where it takes 8 seconds to get a folder listing and I can’t press a letter like “T” to quickly go down to files starting with “T”, and every other trick desktop browsing brings me. I’m not going to edit files with your online editors, nor download them to edit and have to re-upload again. This is a horrible decision on their part and I don’t see the logic in it. Either they are planning something secret and won’t tell people, or they really think people want cloud-only, browser-based file storage. I know I don’t! When you readers decide to switch to Office365 too, you’ll get 1TB of storage, plus all the MS Office apps, cloud features, and ability to share with other users. Click here to take a look. Maybe I will consider them again some day. I wonder why they wouldn’t just keep the existing client and have the new one ready to switch over? They may lose a lot of customers by leaving us dead in the water for who knows how long. Really stupid to discontinue something without the alternative being ready. 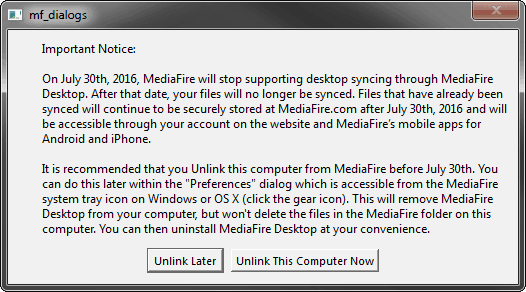 Wonder if any of you guys figured out how to sync from MediaFire to computer after their ridiculous decision to discontinue to software? I still have tons of files on my external HD that I use to sync to mediafire. It would be a nightmare to manually do it.